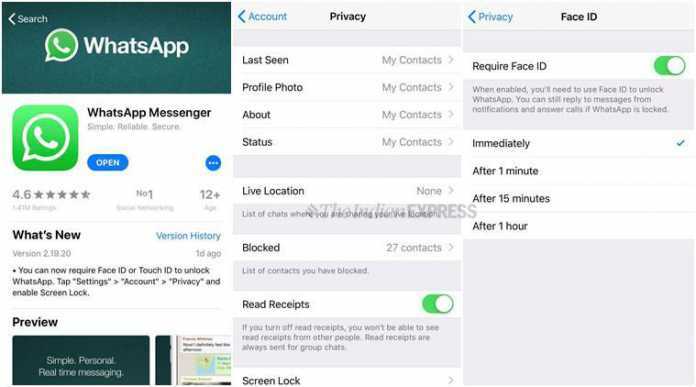 Aiming to keep its messages on iPhones safe from prying eyes, Facebook-owned messaging app WhatsApp on Tuesday introduced Touch ID and Face ID functionality on the devices.”At WhatsApp, we care deeply about private messaging and today, we’re excited to introduce The WhatsApp Enable Touch ID and Face ID on iPhone to help prevent someone from taking your phone and reading your messages,” the company said in a statement. To enable the feature in WhatsApp, The iPhone users need to go to the settings, account, privacy and then screen lock and turn on Touch ID or Face ID. You have the option to select the amount of time before Touch ID or Face ID is prompted after WhatsApp is closed, the company added. The privacy feature has been rolled out for users of iPhone 5s and later models and on iOS 9 OS and above.